Hiroshi Yoshida was a 20th-century Japanese artist who's skill as a woodblock printer was unmatched. I base most of what I know of color off this artist's work. Notice in this group of prints that each one has a distinctive color set. Each image has its own dominant hue, in total harmony, with excellent design and atmosphere. Also notice that there isn't a soft edge to be found. All the "edgeless" brushwork in the world won't turn a poorly designed, color discordant mess into a work of art...ain't gonna happen. Learn the tools to forget the tools! Once in a while I run into people who are Plein Air Purists who insist that if the object was not in front of you the entire time you're painting, then it's not a Plein Air painting. Dogs, horses, cows, vehicles, people, even clouds move away while you're painting. Does that mean we're not supposed to paint them? Maybe I am just getting old, but it’s starting to “P” me off. Our job as artists is to make ART…not churn out door mats! I am not going to curb my inspiration for any rules that over-achievers want to levy on the rest of us. You want to make 8 paintings in a day? Go ahead. . .I'm gonna do just one. . .one good painting. . .that’s all I want. Plein air painting is more difficult. We do need to rely on visual memory, but in case that fails, take a picture of those moving objects if you need it. . .
Just to have reference. . .I make sketches before I start. And for the objects in motion I "Frankenstein" them together from parts of other objects that pass in and out of my scene. 1. I have to paint it anyway, so I am rationalizing the construction before I get to canvas. 2. I find that the camera freezes moving objects too much and I don’t feel the fluidness of them anymore. 3. Third, I have to draw it!. . .Draw it!. . . D-R-A-W I-T! So, within in a few minutes I compile sketches, I look at photos (if I have them) and then I paint. For this particular painting I set up on the sidewalk, blocked in the scene, and left a dark spot for riders who were not even there yet. As I was blocking in, I had my sketch book under my arm and a sharp pencil on the palette. They rode by and as they did, I set down my brush and just observed them. Staring at them with a long unbroken gaze. And when I had fixed that into my memory, I sketched it down. Some were wearing different colored clothing and I needed lighter colors, so I waited for that. . . I even used clothing colors from people who were walking and not on bikes at all! But I can tell you, none of these moving objects were in my line of sight for more than a few seconds. That will never stop me from painting them in anyway. After breaking palette knives, one after another, sometimes after only a week or day of use, I can finally endorse a palette knife. forged from one piece of steel instead of spot-welded. This is a Value/Color Isolator I make for my workshop participants. I am always trying to make these more universal, and this is my 3rd version. It's made from a countertop chip. One side is a flat grey, while the other side has three tones to check for proper contrasts in your painting. The grey is a slightly warmer tone so that you can check your temperatures at near neutral. All paint is flat with a non-glare finish. Here are some process shots from a painting I did this spring in New Harmony, Indiana. Step 1 Starting with a medium to light violet, I sketched the scene on 315 Clausen. Value is the key here. I don't want to waste time having to go back and lighten my drawing to control contrasts. Color is less important, and I may use a different hue for each painting. This stage also shows colorful shadow shapes and a bit more drawing to the middle ground trees. Step 2 I look for the biggest, most imortant value or color mass. 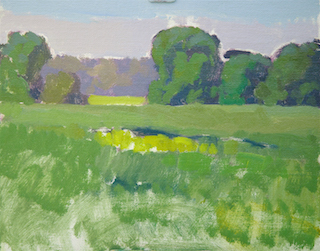 The grassy field has a huge influence on my color and value perceptions. It's also a key player in the sentiment I am trying to convey. To make the landscape read, I know the light side of the tree must be a value in-between the field plane and the tree shadows. I also try to limit my color intensities to the upright trees and not all of the masses. Step 3 Don't get caught watching the paint dry! Get it filled in. Only do what you believe will help you make informed choices about the next few steps. Establish the important relationships. Try to resolve the sentiment. Step 4 At this point, with the important relationships built, I can take a breather. I cut into the trees with sky color to give a more natural organic feel. Adding bird holes, starting to modulate the color of the foreground grasses. Step 5 Finish. Now I can add some "Danger color"...but very thoughtfully. 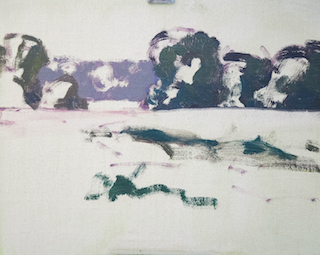 To help tame the greens, activate the mass and give visual excitement, I add a complementary violet. I saturate the canola in the foreground and make sure it is less in the background. For those of you who might be shopping for a Plein Air Rig, here are some suggestions. Whichever you choose, Please read the last item on the list, the support (Very Important). "I only paint outside occasionally, like once every month or year. . ."
The French easel is a design that has not changed much in the last 100 years. It is a universal indoor and outdoor easel. But sometimes setting it up is like trying to put sneakers on a cow. Parts can be cumbersome, and it's not something you will want to hike with. It will hold huge canvases and because of this, I own one of these and use it once in a while. "I paint outside more than twice a month, sometimes even once a week!" No frills, lightweight and easy to carry, this particular box made by Judsons Art Outfitters, Guerrilla Painter is very sturdy. It has the limitation of accommodating only 8x10 and smaller canvases which can be carried inside the box. When I paint I usually paint no larger than 8x10 anyway. A good starter box, decent price. "I paint outside once a week, sometimes even 3 times a week!" This Pochade Box by Judsons Art Outfitter, Guerrilla Painter is a main box for Plein Air painters. Easy to carry, little heavier than the Cigar Box. It usually has compartments and accommodates a range of canvas sizes and accessories. I have a medium size version, but it will accommodate a 16x20 canvas with its telescoping support arm. I strongly suggest at some point you buy an umbrella and mount. The umbrella is for shade not water, and not shade for you but for your canvas and palette. They offer discounts for seconds (slightly factory dinged). Hook for hanging solvent can. "I'm staying in the Amazon jungle for eight months" Rig." All-aluminum construction and will survive many years of abuse. However it is NOT any lighter than the wooden boxes mentioned! Strada Side Tray Useful for mixing paint, holding brushes and supplies. Whichever box you choose (aside from the French Easel with built in legs) you will need a support tripod. Word of advice: Don't skimp here! A flimsy, shaky tripod is the worst thing to try and manage out in the field. I use the Manfrotto Tripods. They are very sturdy and rugged, fairly lightweight and fold up small (ish). I also recommend this kit, or something comparable. A pre-attached "Ball Style" head with Quick Release plate really saves time out in the field. I am a failed artist. I scrape my paintings. I admit it, and I do so often. So did John Singer Sargent (a scraping fool! ), but I guess that makes him a failed artist as well. The list of other scraping artists goes on and on. Not just for starting over, scraping the surface of a painting is also a means of controlling texture in preparation of additional layers. I met an artist on a recent plein air excursion who expressed surprise and disappointment that I had scraped a painting back that I was unhappy with so that I could start again fresh. 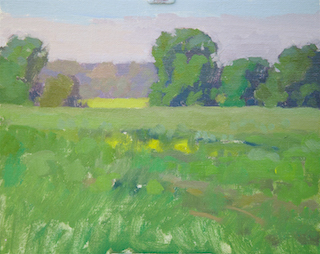 As if I had committed a deep sin that wounded the soul and "Spirit of Plein Air". . .Yada Yada. Careful consideration for the undertone's VALUE and INTENSITY aids in efficient painting in the field. Since I believe that a landscape painting without atmospheric perspective just isn't a landscape, I am always finding ways to promote it in my paintings. It's "de-emphasize contrasts" that I pay a lot of attention to. In short, I control my foreground, middle ground and background contrasts from the very start. If my undertone is getting in the way of that, I'm not working efficiently. I want to avoid having to go back into the painting to lower the contrasts in the background. The value of the undertone should work for us and not against us here. The other aspect of the undertone is intensity or color saturation. I build my paintings on relationships, so if my initial tone is too saturated, I have less control over it from the start. It can inhibit my ability to judge subsequent masses as they are blocked in. Too colorful an undertone, and I am always competing with it. Too grey, and I can't seem to make the block-in colorful enough. Finally, I think the undertone color (hue) is up to the artist. Whatever conveys your inspiration and sentiment the best. The light behind the columns broke thru the trees and filtered past the structure. It was clear to me that this was about warms and cools, but to get that right balance with oil paint, sometimes it is better to paint thinly and take advantage of certain colors' transparency. Once I had established the tone I wanted, I painted in a range of "less warm" colors until I finished with the cool accents. I painted Apollo Spring during the annual West Baden Paint Out sponsored by Indiana Heritage Arts. The Apollo Spring structure marks the location of one of four natural mineral springs that drew people to the West Baden Springs Hotel for their perceived health benefits. The structure stands at one corner of the sunken garden adjacent to the historic hotel. This is a little painting I did close to where I live. I stopped to paint it noticing first the atmosphere as a result from the heat of the day. 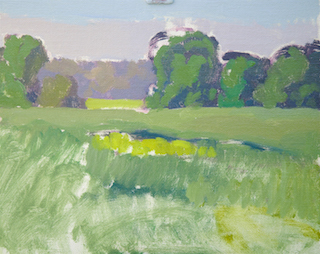 It is my opinion, as well as some other artists, that atmosphere in a landscape painting is essential to express depth. I like to tempt the viewer in by showing depth in my landscapes, like a hiker on a trail who sees the far off hills and mountains lured to adventure. Lot Yachts, isn't really about yachts or lots. It's about the light. My paintings will always be about light and shadow as well as the color of the sky and the air and how a place far from what you know as home can permeate your being. Michigan is one such place for my wife Kim and myself. The water, sand and cool wind that blows off the lake with the music of the waves lapping against its shore. Color is of course my biggest reason for painting and Michigan's cerulean sky, weathered barns, orange oat fields and sails out on the open water all make for great inspiration. I hope you can join me for my show "Michigan Revisited" at Gallery Two.